It’s that time of year again! The time of year of warmth and long, sunny days; the time of year when people hike on trails through forests and up mountains, camp in grassy meadows, etc. Sounds nice, right? Well, if you are doing these activities with your pet, be aware that these are all possible locations for your dog to pick up a tick. Here in Montana ticks are common, especially during and after a wet springtime like the one we’ve just had. The problem with ticks is that they carry diseases that can be debilitating to a dog. You’ve probably heard of a tick bite causing Lyme disease and Rocky Mountain Spotted Fever in humans, but your dog can equally suffer. And it’s more common for a dog, whose fur makes it easy for the ticks barbed feet to cling to, to pick up a tick, more common still to receive a bite, being as how a tick can hide in the fur or the ears of a dog, easily. Now, don’t let this tick stuff scare you. Ticks are here, they’ve always been here, and here’s how you deal with them. 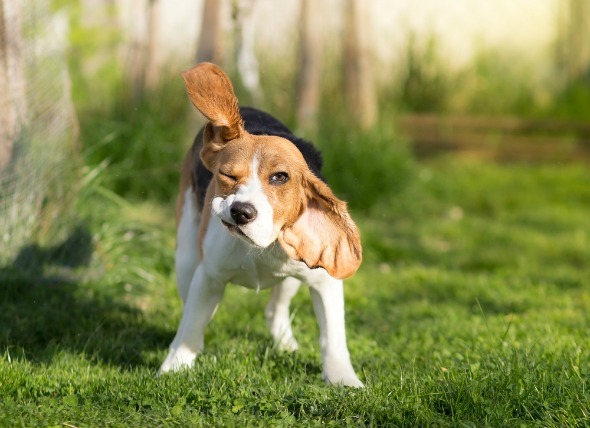 First, there are certain topical medications that can be given to dogs, which decrease the likelihood that a tick will bite. There are also flea and tick collars, which work in a similar way. If you are taking the dog out on a walk, make sure you check the dog immediately after for any ticks that have hitched a ride—You will feel a small hard bump just beneath the dog’s fur. You may also want to comb the hair upward with your fingers, or run a burhs or fur rake through the dog’s coat. Check the ears and the creases where the dog’s legs meet the body. If you find a tick unattached, remove it. If the tick is still attached, remove it by pulling it out in a straight, steady motion. There are also more modern devices being sold not that help in the process.